The Axis Powers controlled most of Europe and were moving in on the rest of the free world. With Great Britain next in the Nazi cross-hairs, Allied forces had no choice but to make one last ditch effort to take back the continent. Over the previous year, British intelligence had fooled an already paranoid Adolph Hitler into believing an invasion was imminent at the city of Pas de Calais, the closest point in France to Britain. With the Nazi dictator’s attention and troops diverted, the Allies would have a small window to capture their real target: Normandy. However, the only way in and out from the beach landing zones were two bridges in Normandy across the River Orne and the Caen Canal still under enemy control. Failure to capture the bridges intact would allow Nazi armored reinforcements to reign hellfire down on the allied troops and stop the invasion in its tracks. Possibly ending the war right then and there with utter defeat for the Allies. These bridges were the key to mission success, but reaching them in enemy territory undetected was a monument risk. Only a small force could be used, and they would have little time before German reinforcements were alerted of the attack. In the middle of the night on June 5th, 1944, elite paratroopers from “D” Company crossed the English Channel in silent glider planes. In the cover of darkness, six gliders delivered a squadron of just 180 men who took the Nazi troops guarding the bridges by total surprise. What would later be known as the “most outstanding flying achievement of the war”, “D” Company unleashed a barrage of machine gun fire and grenades to overtake the bridges within 10 minutes. Reinforcement troops from the 7th Battalion Parachuters were then able to safely deploy behind enemy lines. Together, the Allies held off countless counterattacks, cutting off German tanks, artillery, and support units from reaching the beaches. This secret operation is still widely unknown today, but it would mark the beginning of the end of World War II. Over 60% average annualized returns on every single trade – after more than 66 total recommendations! By identifying under the radar but extremely disruptive events in dividend stocks, the “D-D Indicator” can secure profits worth exponentially more than yields listed to the public. Even better, this strategy has never had a losing year so far. That’s no small accomplishment considering how my “D-D Indicator” has dominated the S&P’s dividend yield over the same time. In 2014, the first year I implemented this strategy in live trading it returned an average annualized gain of 23% …. Compare that to the S &Ps paltry 1.94% yield and there’s really no debate. In 2015 my “D-D Indicator” identified 23 Disruptive Dividend events, each one handing us an average 52% profit. And from 2016 to the end of 2017 we really turned things up with a 69% average return. Mind you, these are actual trade recommendations made in real time to real investors like you. This IS NOT some back tested track record that only works in theory. I’ll explain exactly how I achieved this in the next few minutes. 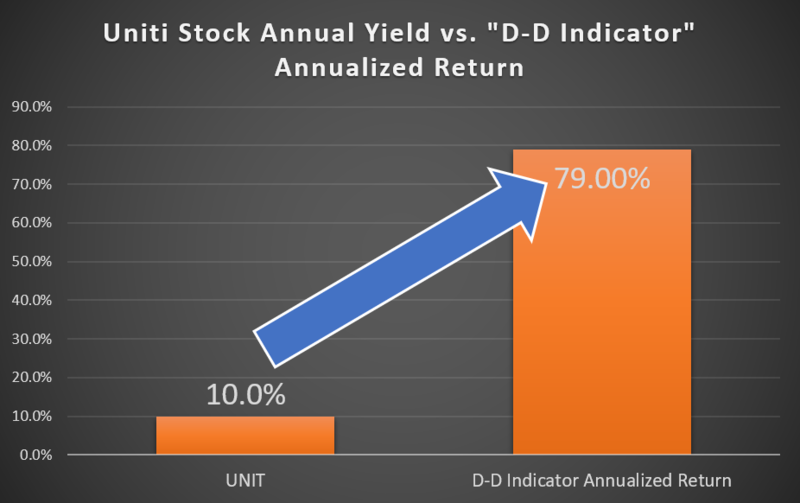 More importantly, I’ll also reveal how you can successfully use the “D-D Indicator” in your own portfolio to take your income and dividend investing to the next level. “[This recommendation] performed like a dream and even exceeded the high end of my expectations. I think this is the 3rd or 4th idea I have received from you where I quickly made more than $10,000.” – Vic B. As the lead Income and Dividend Investing Strategist at Investors Alley, my goal has always been to create Total Retirement Optimization for my readers. But get you through retirement…without ever having to worry about money again…and spending your fortune on whatever you please. To achieve this, your retirement needs to be built upon three pillars: passive income, active income, and growth. The first pillar of my total retirement optimization plan started with the launch of The Dividend Hunter Newsletter, my “set it and forget” cash flow generator. By identifying high-yield dividend stocks that have bulletproof stability of dividend payments, The Dividend Hunter gives you an income you can rely month after month, and year after year. All it takes is reading your monthly issue, then marking your calendar for the days you’re guaranteed to be paid out dividends! This is truly a hands-off approach for thousands of dollars in more cash. The second pillar in our retirement was built when I introduced a more advanced service where I work more closely with subscribers, the Automatic Income Machine. This is a conservative, proven way to grow a small amount of money into a decent-sized portfolio that can support you and those you love for the rest of your life. 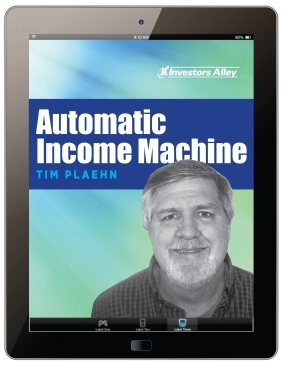 In the Automatic Income Machine, dividends are retained in the cash balance to be put to work to generate future dividend growth. Or in other words, long term wealth building. What about our third pillar? Like I said, Total Retirement Optimization is about not just surviving retirement, but thriving in a way that lets you spend as much money as you want whenever you want. While I love collecting dividend payments marked on my calendar every month, I’m not one to leave any cash on the table. And the fact is, if you want to start generating even higher amounts of income – I’m talking tens of thousands of dollars– you need a way to juice up your returns … to make more money, in a shorter period, than you would ever see from ordinary buy and hold tactics. Which is averaging an annualized return of over 60% on every single opportunity it identifies. I’m not talking about day trading or sitting at your computer for hours at end though. The “D-D Indicator” involves 2-3 new trade recommendations a month that we hold for just weeks to a couple months. Meaning, you’re only looking at 10-20 minutes more a month checking your email to generate potential tens of thousands of dollars or more a year in extra income. And it won’t affect your current portfolio one single iota. So, you can keep on investing as you always have, and holding the same Dividend Hunter or Automatic Income Machine picks you do now, collecting their safe, stable dividends and watching their share prices grind higher. Now, when you’re generating higher income like this, most investors think they’ll inevitably have to sacrifice safety. Or take on high amounts of risk. Not with the “D-D Indicator”. You can achieve all this while keeping the safety and security you’re already accustomed to. In fact, since I started sending out live recommendations to early users in June 2014 my system has achieved a lifetime winning percentage of 78%. Making the “D-D Indictor” the perfect complement to both of my other retirement strategies. Make no mistake, each system alone is powerful and can provide you with life changing results, but together they really do build the ultimate retirement solution. Let me show you exactly what the “D-D Indicator” fits into your own retirement starting today. How I took this ancient military strategy and turned it into the greatest income tool I’ve ever created. That’s me during my fighter pilot days. Loved flying the F-16 and proud to serve my country. The creation of this strategy goes all the way back to my time at the United States Air Force Academy where I graduated with a degree in mathematics. 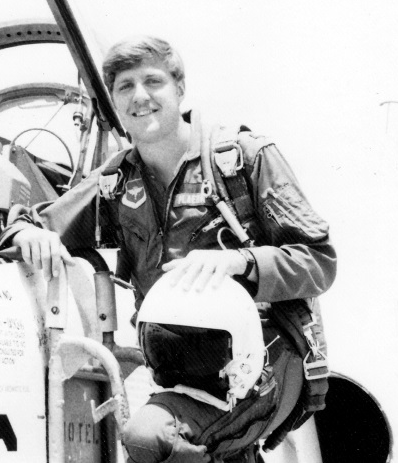 As you may already know, I spent over a decade as an F-16 fighter pilot and flight instructor in the Air Force. It was during those years I also become a Certified Financial Planner and found another way to serve: helping families and individuals plan their finances and make wise investment decisions. As I transitioned to civilian life I realized the wisdom I learned in the Air Force could be used far beyond the theater of war. I had studied thousands of years of military history. The different generals, their strategies and tactics, and their principles of success. But after decades of research, the Coup de Main stood out to me above all others as something that could be used in the markets to change everyday investors lives. The Coup de Main was used by military masterminds like Genghis Kahn, the founder of the Mongol Empire, whose horseback archers could move with unparalleled speed and deception. The Mongols would strategically get their enemies to underestimate them and then strike unexpectedly with such quickness that they easily defeated armies over ten times their strength. The great French general and emperor, Napoleon Bonaparte would attack at inopportune or even foolish moments if he knew his enemy had divided leadership and internal cracks. A swift and surprise attack would cause dissension to break out and the army would self-destruct. Fredrick the Great of 18th century Prussia sacrificed strength for speed as he discovered a faster army has higher morale, made fewer mistakes, and even created a sense of boldness that attracted new forces. Many who used the Coup de Main on the battlefield used it to great effect in daily life as well. The Roman Emperor Julius Caesar’s unpredictable reputation made people incredibly cautious in his presence which allowed him to catch his enemies off-guard at any given moment. Former U.S Secretary of State Henry Kissinger would lull his opponents with boring rhetoric until a deadline approached when he would suddenly spring a list of demands that caused the other side to act irrationally and make mistakes. After being elected president in 1932, Franklin D. Roosevelt disappeared from the public stage until his inauguration where he gave a speech that energized the nation with a series of bold legislative proposals aimed at congress. This unexpected intensity built him momentum from the public who were convinced he meant business. Top performers across various fields of expertise have used it to achieve the highest levels of excellence. For instance, in Silicon Valley startups like Uber, Netflix, and Airbnb used the Coup de Main plan of attack to disrupt centuries old industries and capture unprecedented levels of market share. More established tech companies like Amazon continue to use the Coup de Main to dominate their competition. The online retailer behemoth is now worth $355.9 billion, more than almost every brick and mortar retailer combined. Legendary football coaches Jimmy Johnson and Bobby Bowden revolutionized the game in the 80’s by going against the “bigger is always better” status quo. Instead, they focused on faster, smaller players who could play anywhere on the field, which introduced never seen complex formations that constantly left their opponents guessing. Legendary investor Warren Buffett even made the Coup de Main an integral part of his empire. On the surface you might think Buffett is a head stretcher, but that’s only when you look at his rise to the top in retrospect. In the moment, most of his successful investments shocked the world. He’s made his entire career on finding value where no one else saw it and then making massive bets on their potential. American Express, which had provided warehouses and vouched for the company’s inventory, was obliterated. In the period after the scandal broke, investors couldn’t sell shares fast enough, and the stock plummeted 50%. Buffett, however, saw this moment of panic for just what it was – a drawback for an otherwise very stable company with long-term growth potential. Buffett had the foresight to see credit cards were the future of daily transactions, and recognized American Expresses’ potential to become an American blue chip. The Berkshire Hathaway CEO purchased shares for 17.2% of the company with a cost basis of $1.28 billion. At the time, Wall Street called Buffett a fool for moving so fast on what they deemed a high-risk investment. Today, American Express is worth $14 billion, and The Oracle of Omaha has secured a return of over 990%. These are the two common factors in each of these success stories. And the reason my “D-D Indicator has been able to post an average annualized return of over 60% per trade in just the last three and a half years of real time trading. While at the same time maintaining the safety and security with a remarkable 78% win-rate. My point is simple. If you are frustrated with your retirement plans and you’re thinking about trading to boost your portfolio … don’t put another penny in the markets until you finish reading this briefing. But first let me explain this strategy and why it can work so well for any dividend investor. How to “Read” the Markets with Stunning Precision. You see, the simple fact is, the market is driven by two main emotions … fear and greed. Any time the market swings from fear to greed you want to buy. And when it goes from greed to fear you want to sell. The market has always been this way. In fact, W.D. Gann used this knowledge to turn a few hundred bucks into $50 million back in the early 1900’s. Now, every investor knows triggers like jobs and earnings reports can swing the market. But until recently, nobody realized there are certain dividend related events that cause the same type of rapid movements. I call them “Disruptive Dividend” events. And the “D-D Indicator” is designed to predict exactly when these types of events are going to cause major market moves. In short, it tells me when the sentiment on a stock, ETF or market index is about to swing from fear to greed or vice versa. There are 5 specific types of Disruptive Dividend events that cause my indicator tracks. Basically, that’s when fear or greed has taken over the price of a stock or market, overpowering the underlying fundamentals. When these emotions reach an extreme the market is either overbought or oversold and typically we can expect the market to snap back like a stretched rubber band. What decades of data has shown me, is that there are 5 types of dividend events that consistently create these types of swings in the market. Inspired by the Coup de Main, my “D-D Indicator” is designed to find these disruptive dividend events that take other investors by total surprise … and get you in and out with remarkable speed. Consider what happened to Uniti Group, a real estate investment trust (REIT) in a unique niche of owning copper and fiber wireline networks as its primary asset. In April 2015, Uniti was spun-off by telecom services provider Windstream Holdings, Inc. to become the owner of much of Windstream’s wireline infrastructure assets. The assets came with a 20-year commitment from Windstream that ensured Uniti will be able to pay at least the current $0.60 quarterly dividend for the next 20 years. Since its IPO, Uniti’s been an active buyer of telecom infrastructure assets, showed significant growth, but it’s share price was incredibly volatile. In late 2016, 3rd quarter earnings crushed Wall Street’s expectations. Yet, Uniti’s share price declined from around $27 to the $24 range. My “D-D Indicator “immediately identified this Disruptive event that gave my readers a great opportunity to get in at an extremely undervalued price. My data showed that investors would soon flock to Uniti at this value when they saw it guaranteed a dividend payment for at least the next 20 years. Which is why on December 5th I sent an alert out to buy Uniti…and within less than 3 months my readers could have secured an annual gain of 79%. 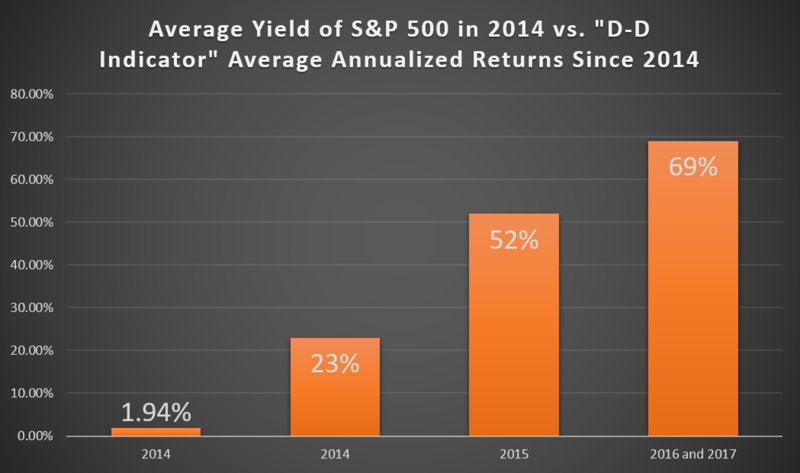 My “D-D Indicator” routinely identifies Disruptive Dividends events on many high-yield stocks for other reasons. One is a repeating pattern of share price swings between ex-dividend dates. In the psychology of the stock market dividend investors can’t help themselves and want to load up on high-yield shares just before the stock goes ex-dividend, and then sell right after they collect their payment. This drives the share price up and more investors buy in. But, right after the ex-dividend selling pressure comes from a combination of “traders” attempting to dividend capture who sell after earning the dividend. Most of them lack any interest in holding the stock since it will be three months until the next dividend payment. This causes great stocks to become incredibly undervalued, altering my “D-D Indicator” there’s money to be made. For example, a few years back Kohlberg Capital Corporation was paying out a monster 14.4% dividend and dividend capture traders were all over it. 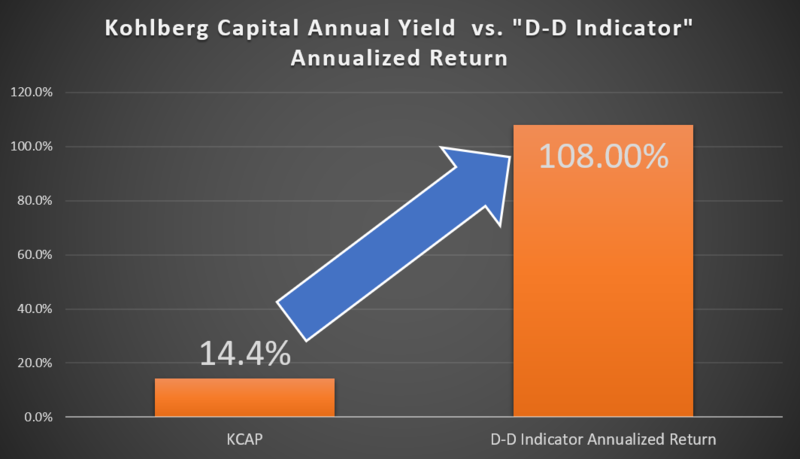 The “D-D Indicator” showed me Kohlberg Capital was 14% below the peak price before the last ex-dividend date, and I immediately sent an alert to my readers to get in. The bulls soon returned to the stock, unable to resist such a yield, and in just about six weeks we excited the trade for a fantastic annualized gain of 108%! Or how about Plains GP Holdings LP who early last year announced a simplification agreement with their affiliate Plains All American Pipelines LP, essentially combining the two separate holdings into one corporate security. The benefits of the agreement were poised to send Plains GP Holding’s dividend yield all the way to 7% by the time the agreement was completed at the end of the year. Investors should have been pouring in but a sudden panic in the energy markets sent the entire sector down, Plains GP included. Many analysts were bashing the stock for the sake of being an energy bear but on August 1st the “D-D Indicator” discovered a quick swing in the market to the upside was imminent. So, we issued a buy on the stock. Sure enough the stock started bouncing back when dividend investors realized they could make easy cash on the agreement and five weeks later we told our readers to sell the position for a 167% annualized return. Now I don’t know about you … but these types of gains get my heart pumping. And this is exactly how I find them. Often, it’s just a matter of time before the “D-D Indicator” goes from a “monitor” to a “buy” signal. his happens 2 or 3 times a month — sometimes more — and often a single stock will undergo a Disruptive Dividend event we can play from every quarter. Most of the time a stock will move within a normal range. But sometimes — in fact, more regularly than you’d expect — a stock swings to an extreme. The propriety formula behind this strategy is based on decades of market data and sentiment. Large Dividend Increases – every so often companies increase their dividend due to cash flow increases, this — like special dividends — makes an extreme swing likely. Reverse Dividend Capture Opportunities – while most investors target high yield quick cash grabs around the ex-dividend date – buying after they sell gives you an incredible way to take advantage of undervalued stocks who quickly recover their losses. When this all started, I was investing in these plays for the dividend itself, but the gains I was taking home were so big that I often ended up selling before the dividend was even paid. 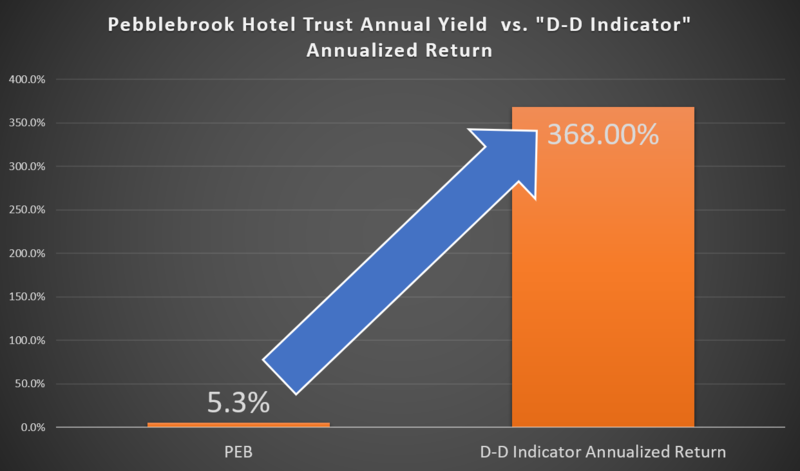 For instance, in February of 2016 the “D-D Indicator” Identified Pebblebrook Hotel Trust was on the verge of a 20% to 24% dividend increase to be announced a month later. While other ignored this stock because it looked like it was going nowhere, I immediately alerted my readers PEB was a buy, and sold just two weeks later, making a 368% gain! 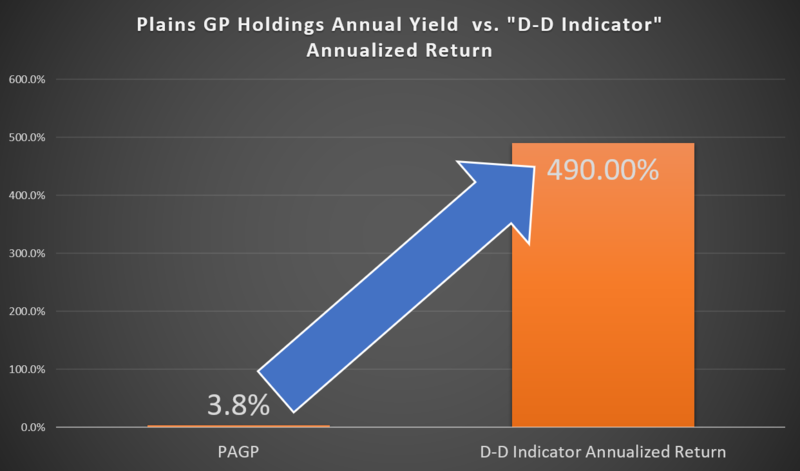 A few months later in May 2016, the “D-D Indicator” altered me of a huge opportunity in Plains GP Holdings LP whose payouts had leveled off the previous year, but were poised to spike in anticipation solid earnings in an otherwise grim energy market. We bought in on May 3rd…and got out on May 16th… pocketing a massive 490% gain! Now, I’m showing you these gains not to brag. But rather to prove to you that when it comes to identifying and seizing opportunities … the “D-D Indicator” is a powerful strategy every income investor can use as part of their portfolio. And they could be HUGE ones. Can Take Massive Profits on Today! The first opportunity identified by my “D-D Indicator” was triggered by a recent Disruptive Dividend event in the IPO markets. It’s parent partner has produced annual high 20% distribution growth, and is rated as one of the safest for sustaining its growth rate. 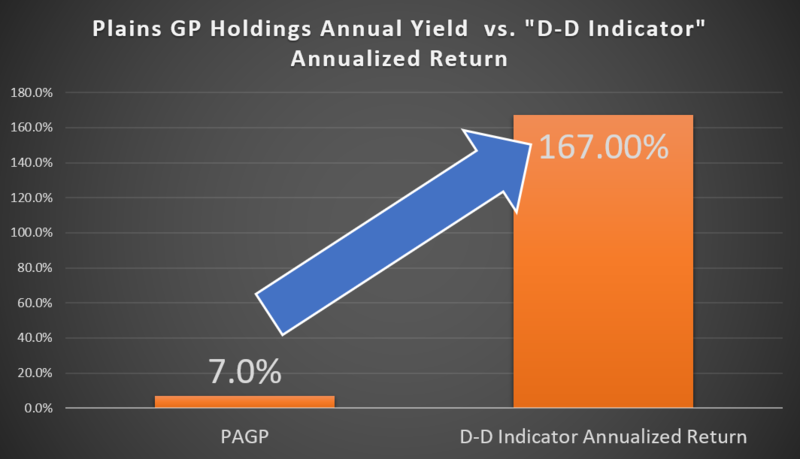 My “D-D Indicator” is predicting 2018 dividend growth guidance of 110% to 114%. This under the radar stock hasn’t yet begun to price in this massive payout growth, and the share price has stagnated in the low double digits. The dividend increases will come every quarter, and my forecast is for a triple digit annualized return the first few months of 2018 if you get in today. The 2017 third quarter share price crash event of this telecom trust has created a once-in-a-decade opportunity. The share price of this stock plummeted on news of financial restructuring by a holding group that accounts for 70% of this picks fiber network revenue. Despite the share price drop, the company’s revenues are very secure, and they will continue to pay close to a 14% yield. This massive yield attracted a frenzy of investors who attempted to capture the dividend at the end of 2017. Like clockwork this drove the price up, but immediately back down after the money grabbers jumped ship. This gives you an incredible opportunity to get in at a very cheap price for a potential massive profit. In fact, my “D-D Indicator has actually identified trades on this stock before for almost 100% annualized gains in less than three months! The third and final Disruptive Dividend event my indicator has identified comes in the form of an energy company who who’s share price was decimated by 60% because of the 2017 sector collapse in natural gas prices. It never made any sense to me because when you consider the actual makeup of the business you realize it only relies on pure natural gas deliveries as a small portion of its revenue. This is a company that generates stable revenue, EBITDA and massive free cash flow, which is why it returned investors close to 100% in value gains and distributions in 2016. Recently, this company raised its dividend to a solid 11% which are attracting investors back into the stock. When Wall Street realizes that they made a huge mistake in 2016 devaluing such a fantastic company, I have no doubt in my mind we will see the share price sky rocket. This pick is poised to give investors a 100% return in 2018 again. The question is not whether the value will go up, but how far up? Again, my “D-D Indicator” has identified trades on this stock before that have handed my readers over 300% annualized gains in just over a month! Alone, anyone of these recommendations could make mega income in 2018. Together, just imagine the type of extra cash you could be swimming in? I’ve just released a brand-new report detailing the rationale behind where, why and how to profit from each of these stocks, including ticker symbol, entry price, and target price. It’s called “Top 3 Disruptive Dividend Stocks for Breakout Profits” and it’s simply the best recommendations coming out of the “D-D Indicator” for 2018. Normally, I would charge $396 for access to these top-level plays. But in a minute, I’ll show you how you can instantly get access to this report for free. It has augmented my approach to the markets … my strategies to enter trades … even the specific investments I recommend to readers. So, I created a breakthrough investing service specifically designed to help any investor make extra income from these Disruptive Dividend events. I call it 30 Day Dividends. This is my ultimate solution for building the third pillar needed to achieve Total Retirement Optimization – an active income. 30 Day Dividends provides you with higher income opportunities like the ones highlighted throughout this briefing every single month of the year. And don’t worry, active might sound like a lot of work… but that’s why I created this service – to do the heavy lifting for you. Besides potential tens of thousands of dollars in extra cash, the only difference you’ll notice going forward is the few additional emails you’ll receive from me. If you feel comfortable with the trade opportunities I send you, just enter them into your online brokerage account. When you’re generating returns like this, most investors think they’ll inevitably have to sacrifice safety. Remember, NOT with 30 Day Dividends. Since I started sending out live recommendations to early users in June 2014 my system has achieved a lifetime winning percentage of 78%. That is basically as good as it gets when you’re looking at the type of cash were pocketing. … filled with thousands of dollars of extra cash to spend on whatever you want…whenever you want! As soon as you sign up for 30 Day Dividends you’ll immediately receive a password to access my private online membership website. 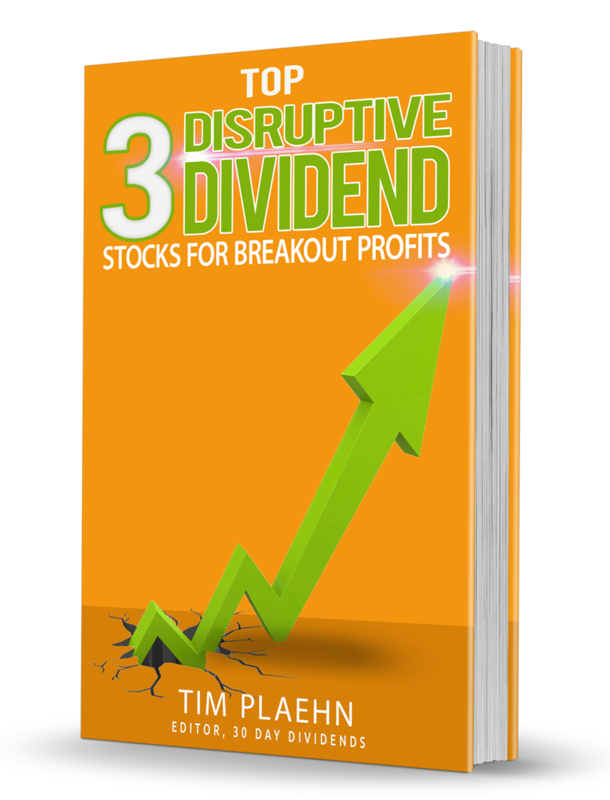 It’s here that you can download my members-only report: “3 Disruptive Dividend Stocks for Breakout Profit”. Top Level Access to my “D-D Indicator” Data and Research – Every month you’ll receive a complete briefing of potential Disruptive Dividend events on the horizon. I’ll include every piece of crucial data and analysis coming out of my “D-D Indicator,” including where exactly in the market these disruptions are forming and the most important metrics you need to know. Remember, no one else in the world has access to this information. Between 2 and 3 New Plays (sometimes even more) – You’ll find each issue filled with in-depth research and analysis on the latest opportunities for collecting your “D-D Indicator” profits just weeks from the recommendation. I’ll also provide guidelines for the buy-up-to price, when to sell and how to create stop-losses. Real Time Trade Alerts – As soon as a profit opportunity comes up you’ll get a brief email from me with details on the trade. That way you can act fast and buy right away or take a little time to do your own research on my recommendation. Regular Portfolio Updates – I’ll keep you constantly updated throughout each month via email and the situation warrants. 30 Day Dividends move fast, so I’ll always notify you of the most profitable time to collect your profits. Current Portfolio Recap – You’ll always be aware of any updates to your current positions. Every month you’ll receive a full portfolio recap, so you know what’s going on always with your investments. Unlimited Access to the Archives – You can collect from “D-D Indicator” Alerts in as soon as 30 days from taking your position. Because this group of stock moves so fast, we may book returns from the same company, multiple times over a year, to extract even more profits. For this reason, you’re going to have unlimited access to the archives, so you can check out previous analysis to help you with your investing. Unlimited Personal Correspondence – If you ever have any questions about your trades, membership or just want to say “hi” my inbox is always open to subscribers. 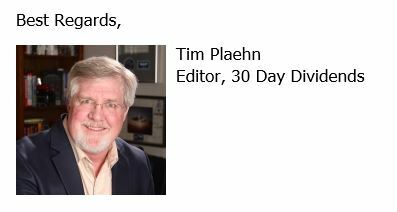 You’ll find my personal email inside each issue of 30 Day Dividends. If you haven’t noticed by now, I’m all about speed. And sometimes even waiting a few weeks or months is too long to take advantage of my system’s alerts. Which is why I recently added on a brand-new tactic to 30 Day Dividends, my “D-D Instant Income” recommendations. And even if the company has never paid a dime in dividends to investors! We use the “D-D Instant Income” tool within 30 Day Dividends to boost our income even higher with on demand cash payments of $190… $265… $414… even $950… flowing into your brokerage account every week! Let’s say you own 500 shares of a dividend stock like I recommend in my other dividend services like The Dividend Hunter– for example, Targa Resources. Targa Resources pays a nice dividend of 8.3%… but you must wait every 3 months for your payments. However, you can us the “D-D Instant Income” tool on Targa Resources to collect that cash right away…at an amount way higher than if you waited till the company paid out to regular dividend investors. … or $1,075 in instant cash income for your 500 shares! On average, my “D-D Instant Income” tool pays out an average of over $600 every single trade! Plus, using this strategy is so safe, that the IRS lets you do it in self-directed retirement accounts. The truth is, I used to offer this strategy as a separate service that subscribers paid $197 a year for. However, I realized combining it with 30 Day Dividends would build a practically unstoppable active income portfolio. Together, you can secure higher return trades that take a month or two to play out while collecting cash profits right away from the instant income payments. And you’re not going to pay an extra cent for it. Consider it a token of good faith for joining our team. You’re going to receive access to 2-3 of my “D-D Instant Income” recommendations every single month. That means you could be collecting an extra $21,000 or more a year in cash…at no extra cost to you! That is, only if you join 30 Day Dividends today. Unfortunately, I won’t be giving access to the “D-D Instant Income” recommendations after today. Like I said, I wanted to reward my most loyal subscribers, and this is my way of doing that. Plus, if you join me TODAY you’ll save big! With my connections in the military, I’m confident this service is easily worth north of $5,000 to big time data firms. Remember … this is an extremely powerful and innovative system that can significantly grow your income portfolio by trading little known disruptive dividend events all throughout the market at any time. I don’t know of any other investment service that even comes close to results like this. And as a member of 30 Day Dividends, you’ll have complete access to my top tier “D-D Indicator” recommendations, data, research, and real-time alerts…. Giving you the winning edge that could boost your dividend yields listed exponentially higher than those listed to the public. So naturally, the research isn’t cheap. This service retails for $1,995. I’m so confident you’ll enjoy and profit from 30 Day Dividends that I’m going to give you 60 days to try it risk-free. Start your membership today. Download and flip through your special report with all three of your first recommendations. Then get ready for even more high income plays as I send you 2 to 3 trades a month. After all that, if you decide after nearly 2 months that 30 Day Dividends isn’t right for you, no problem. Simply let me know and I’ll issue a full refund. Plus, you get to keep your special report with my thanks just for trying 30 Day Dividends out. Simply click the button below to secure your membership… or keep reading below to review all 7 of your membership benefits. As soon as you join, you’ll receive instant access to my premium income generation strategy that’s racked up a remarkable 78% win- rate over 3 years of real time recommendations… while returning on average an over 60% annualized profit on every trade. The D-D Indicator is a proven and safe strategy to begin generating over tens of thousands if not hundreds of thousands a year in more income. Every month, I’ll track 50 to 70 potential plays listed by the indicator …and when it signals a buying opportunity, I’ll send you an email alert with the trade instructions right away. Sometimes my “D-D Indicator” alerts me of opportunities that don’t even take weeks or months to play out, but days. These are special types of cash plays you can collect on demand. On average, every instant income trade my indicator signals pays out over $600! Every month, I will also search the markets for these “instant income” payments…and when I find one, I’ll send you an email alert with the trade instructions that could put cash in your pocket in as little as 10 minutes. You never have to worry about researching new trades or watching the stock tickers all day to check on your positions. Instead, my “D-D Indicator” will scour the markets looking for the best trading ideas … and I will send you the best recommendations them 2-3 a month. Then I will monitor each position 24 hours a day and provide you with any updates you need to know. Every time I recommend a move you’ll get a “BUY” or “SELL” alert sent instantly to your email inbox. And, if you decide the trade is right for you, what to say — word for word — to place the trade on the phone with your broker. This is a private, members-only location where you can get updates on all our open and closed positions, check your alerts, and access all important research, special reports, and intelligence briefings from the past three and half years. A 60-day no-risk trial. In short, you must be 100% satisfied with everything I provide … the research, the trades, even the special reports … and you MUST be certain that this is a solid investment … or simply call our offices within the first 60 days and receive 100% of your money back. The 3 stocks you should buy now to collect potential massive returns from dividend disruption events about to swing the markets. …while still maintaining the safety and security your used to in my other services. Step-by-step guidance from a long-time successful trader, and access to a system to get you the results you want. Plus, you’ll quickly find out that you have the potential to make back the cost of your subscription in just the first month alone. So, it’s decision time right now … and I’ve done everything to make help you make that decision. I’m even offering you a 60-day, risk-free trial membership to give you peace of mind you are making the right decision. Simply click on the button below this video to start your no-obligation trial membership to 30 Day Dividends. “D-D Indicator” Alert #1 will soon be on every headline from the Wall Street Journal to Market Watch as an IPO darling every investor will want to get their hands on. “D-D Indicator” Alert #2 is staggeringly undervalued after investors dividend captured it for quick profits…and they’ll be back in the next few weeks to drive the price to the moon! Finding this type of stock at its current price is a once in a decade opportunity, but dividend hawks are already starting to chatter. It won’t be long till the share prices skyrockets over 100% or more. For the chance to return on average over 60% annualized profit on every single trade you make…. And total risk free- then you need to act now. To get started, simply click the button below, which will take you to a secure order form. There, you can review the terms and everything you’ll receive, before submitting your order. I’m shutting this offer down in just a few days, and after that, you’ll have to pay a much higher price to join us. 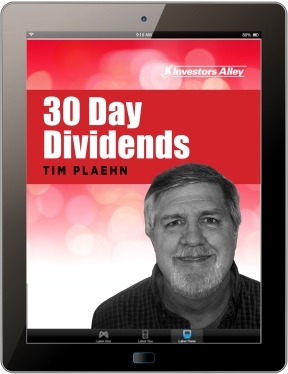 My newest issue of 30 Day Dividends comes out on February 16th with even more Disruptive Dividend opportunities for you. Again, click on the “Order Now” button below. Thanks for your time. I’ll have much more to say to you about these opportunities after you’ve started your membership. PS. If you’re still on the fence about joining, I’d like to help you put things in perspective. The average retirement advisor charges between $100-400 PER HOUR. Just one day of work can put you back over $3,200. Not to mention fee-based planners charge a percentage of the money they’re managing as well, usually about 1% to 2% of clients’ assets. On the other hand, when you join 30 Day Dividends you receive top level access to my research that I spend over 3,000 hours a year working on. This isn’t just a job for me… my entire life is dedicated to helping my readers achieve Total Retirement Optimization. And 30 Day Dividends is a crucial piece in that puzzle. No matter if you’re still years away from retiring or already retired, I believe this is the fastest and safest way to generate significantly more income from any sized portfolio. Because I have no doubt my mind that you’re going to absolutely love 30 Day Dividends. 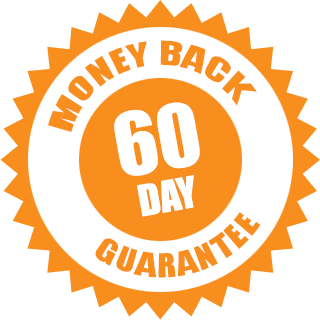 And with our 60-day full money back guarantee there is absolutely no risk in trying it. P.P.S. Like I said, everything I do I do for you. It’s my mission to help as many everyday investors as possible live a life they never imagined they could live. But don’t just take my word for it. “Thank you for your down to earth, straight forward advice on dividend investments! Of the couple services I subscribe to, I believe that yours truly looks out for the investor unlike some who are only interested in lining their own pockets.” Bill P.
“I wanted to thank you for your insight and analysis of the market with a particular focus on dividends and opportunistic share value growth. Using your recommendations is really working out for me. This is the first time I have felt that I have a relatively safe strategy for investing to get an income return that is acceptable for my retirement!” – Tom R.
“I have to say I have subscribed to a number of newsletters over the last 20 years of my investing life. They all promise ‘you’ll make your fee back in no time.’ Yours is the only one that lived up to that. It is no exaggeration to say I have made 9 to 10 times the first-year fee BEFORE dividends using the “starter” portfolio.” – Tony J. “Thank you for providing the simply extraordinary service” …” Since I joined, I’ve been reallocating my portfolio so that I now have a position in each of your recommendations. I’ve been so pleased with the results that I went and became a lifetime member of the service.” – Ed W.
“Thanks for what you do, my account balance hasn’t looked this good ever, and I’ve only been onboard a few months.” – Brad B. And this last one really says it all. “I have tried several newsletters and yours is the only one I have stayed with.” – Vic B. These are the kinds of notes I receive all the time and show me that my Total Retirement Optimization mission is truly making a difference in the lives of real people… that we’re doing something good here. Won’t you join Vic, Brad, Ed, Tony and thousands of others so you can start generating life changing income from 30 Day Dividends? Click here for more.